CD Packs for DJs looking to play with their CDs, USB and other media. 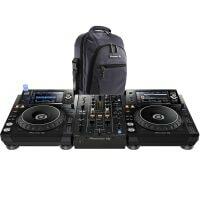 Complete packages available which includes DJ CD Players and a DJ Mixer. DJ Media Players are a fundamental tool for more advanced and professional DJs. If a beginner can get their hands on these units, even better! Most players include CD Players, USB, SD and MIDI options. DJ City understands the high price that can come with buying CD Players and a mixer separately, so we have come up with a few dj packages to suit your style and needs. Get a fantastic deal on a DJ CD Player Pack.